GlassFish 3.1 arrived! Yes sir, we do cluster now! 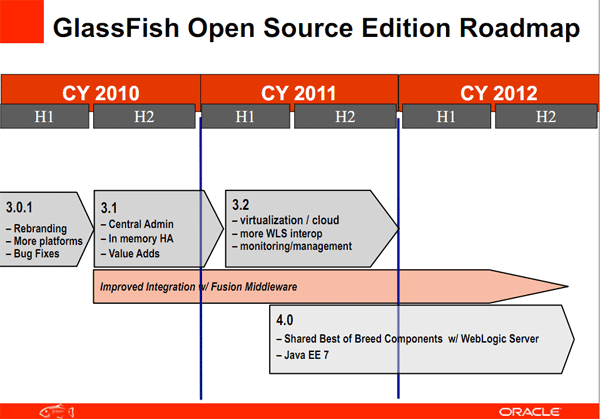 GlassFish 3.1 is finally there. As promised by Oracle back in March last year! And it is an exciting release. It brings back all the clustering and high availability support we were missing since 2.x into the Java EE 6 world. And there are other really nice things on the feature map. Here is your short introduction. As usual you can get the latest GlassFish Open Source Server 3.1 release (which is completely the same as the latest RC3/RC4 btw) from glassfish.org/downloads/. They should be there the minute this post was issued. The commercial version Oracle GlassFish Server 3.1 is available via otn.oracle.com. Both can be downloaded with a Web Profile only or the full version. Multiple clusters per domain, multiple instances per cluster. Up to 100 instances per domain! GlassFish Server uses secure shell (SSH) to ensure that clusters that span multiple hosts can be administered centrally. The use of SSH to enable centralized administration of remote instances is optional and is required only for specific operations. Instances local to the DAS can be administered without SSH. If SSH is not practicable in your environment, you can administer remote instances locally. A reworked GF Embedded API is there to satisfy your needs! A complete backup and restore solution for the complete GlassFish domain. A cmd line client for your monitoring needs. Stateful HTTPSession clustering with Oracle's Coherence (will be available with Coherence version 3.7 which ships later the year. Separate LB Plugin with it's own installer. The roadmap has been updated, too. As usual this was published with a safe harbor statement in front, so you know what to think about it. It's most likely going to happen but nobody will pay you anything if you rely on this. Together with the new GlassFish release a Java EE SDK Refresh (Update 2) was pushed out as well. There will be a launch webinar at 10 AM (PT) / 7 PM (CET). And as always you can find lot's of great resources and engineer blogs via theaquarium blog. Go check them out! And enjoy the new GlassFish release! Finally: This was a hard piece of work! Congratulations to all the engineers working on it! That makes it very easy to try out the commercial bits!